I don’t know why I put off reading this surprising book. Once started, I read it from beginning to end, not wanting to stop. Then I found myself wanting to read it all over again. 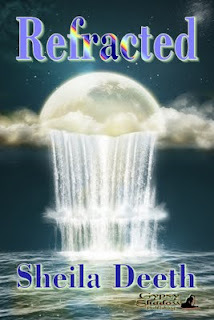 It isn’t until you’ve finished Refracted that you completely understand what you’ve been reading, and why the story is structured the way it is. It all comes together in the end. Sheila Deeth has an incredible talent for writing vivid description that captures the imagination. She is very good at putting you into her scenes with sensory impressions. You can almost see the sights, hear the sounds and smell the scents. The first seven chapters begin similarly with, “We played, ran or walked ‘through the fields’ that day.” There is a reason for this that is disclosed later in the book. Each chapter is about a different youth in a different setting, many are Biblically familiar. You’ll find yourself on Noah’s Ark in chapter one, then with Moses in chapter two. See if you don’t relate to the other settings as well. Each chapter stands alone, yet each follows a familiar theme of love, danger and separation. Should I give away the end? Even a tiny portion? So tempting, but sorry … decided not to. The end provides cohesiveness, and it’s why I wanted to read this short novel over again with more understanding of what was taking place. I appreciated it all the more the second time through. Even the cover represents much of what is in this novel, but again, all its significance isn’t apparent until you’ve finished the book. No one else writes like Sheila Deeth. The depth of her thoughts combined with her vivid depictions make her novels unique. This is one genre that goes beyond explanation. You have to read it to experience it. Get a an eBook copy from Amazon, Barnes & Noble or Smashwords.com. Sheila Deeth’s writing will surprise you too. Thank you! What a lovely review, and I'm so glad you enjoyed it.